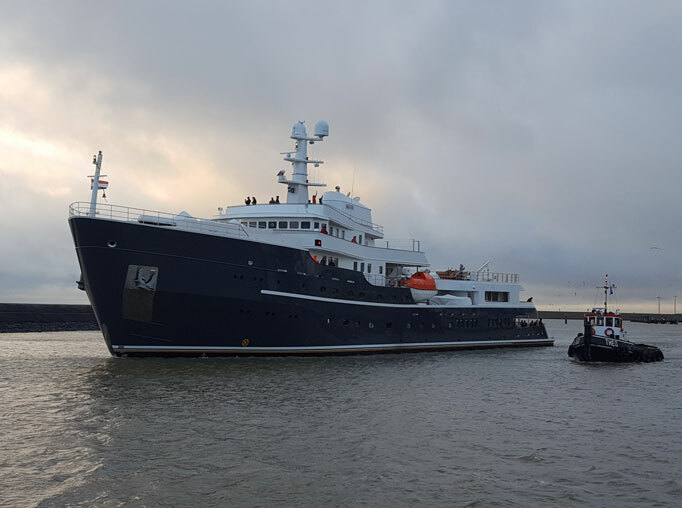 Just three months after her successful launch, expedition yacht Legend left for her maiden trip. With exterior design and naval architecture by DIANA she transformed into an icebreaking passengership with a 1B-Swedish/Finnish classification. She was lengthened in the stern by 3,60 metre, completely restyled by extending the superstructure and rebuilding the mast to make her sleeker and more attractive for future charter guests. More deck space is created for relaxing and enjoying the environment. Heavy cranes were added to lift all toys and tenders one can imagine. The aft deck was transformed into a fully classified helicopter deck. Above that she is fully Lloyd’s and SOLAS certified. She left Icon Yachts in Harlingen last evening and went out into the Northsea for her first nautical miles. Within a short time she will receive her first guests who can enjoy a safe and comfortable experience on board this amazing yacht. The fully classified helicopter deck on the aft deck, a swim platform and large swimming pool / Jacuzzi in the stern, a luxurious submarine and lots of watertoys and tenders strengthen the feeling of pleasure and excitement. The fitness room, movie theatre, bar, and a music corner with a Grand piano and other music instruments for nice live music offers enough for inside entertainment. Legend is a fully Lloyd’s classified Class 1B icebreaking ship so she is capable to visit all areas of the world such as the Antarctic’s in safety. Her darkgrey hull gives her the elegance she deserves and makes her stand out beautifully in arctic areas. With a total length of 77.4 meters she is capable of carrying 30 guests in all comfort and luxury one could wish for, experiencing the trip of a lifetime.